I've found the resistor on the board, but how do i adjust it? should it be replaced with a potentiometer? or is there a way to adjust it? Offtopic: What kind of hotel are you looking for? how many people? what price range? (some hotels are very expensive) what would you like to do in or around Noordwijk? You could replace it with 1K resistor in series with 10K rotary potentiometer to be variable. If that doesn't work with your Onkyo TX-NR626, you could build a special cable for the external "IR IN MAIN" IR connection input - but this is worth a complete new topic. I would recommend the variable resistor. The other devices should still work, because it should be just a minimum adjustment. If the difference of the R4 resistor is too high that other devices won't work with the new resistor value, it could be indeed necessary to build another one. But I would try before buy, then you know what you've to expect and if this works with your TX-NR626. Offtopic: Thanks, I'll compare the prices next year before booking. Yes, looks nice, but it's not necessary to order them, because you've dozens of resistors and very tiny variable resistors in old PC parts like CDROM or DVDROM drives. Thank you for the patience and all the help and suggestions!, all i have to do now is find a suitable container for it, i was thinking of placing the IR-Reciever on my tv and connecting it by wire to the PCB. We also offer a tiny box for the infrared repeater in the fanshop with or without space for the battery. Most TVs have enough USB ports to use one for the IR repeater. 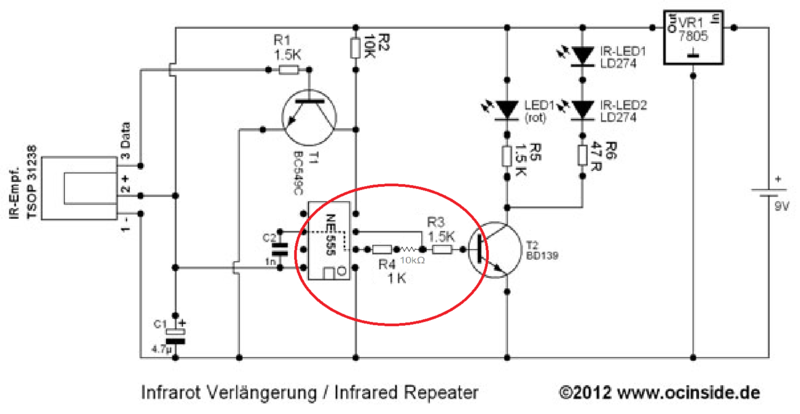 After using the IR repeater for a while, I used 3 battery’s, it seems that when the battery’s voltage is below 8V the IR-Repeater doesn’t work anymore, the IR-LEDS are very weak and the red light lights up continuously (not flickering). Is there something wrong with my build? Can I replace the 9volt connector with a usb connector? May be you've bought another 7805 type or there's a disturbance source. Yes, you can, in this case you don't need the 7805. Just solder out the 7805 and solder +5V and GND from the USB conntector to these pins.